I wanted to share a little bit our family farm's history. The scene above, that serves as Joseph's Grainery's logo, is on our farm near Diamond, Washington. The original picture was black and white and was taken circa 1939. That's my Great Grandpa Joe and his brother Bob. A Cletrac (yellow tractor) is pulling the Combine over the rolling hills. The valley in the background is the Palouse River valley. My Great Grandmother is an artist and she colorized the original photo. This is what we call our "Home Place" near Diamond, Washington. There was another house on this same location that burned down in 1936. 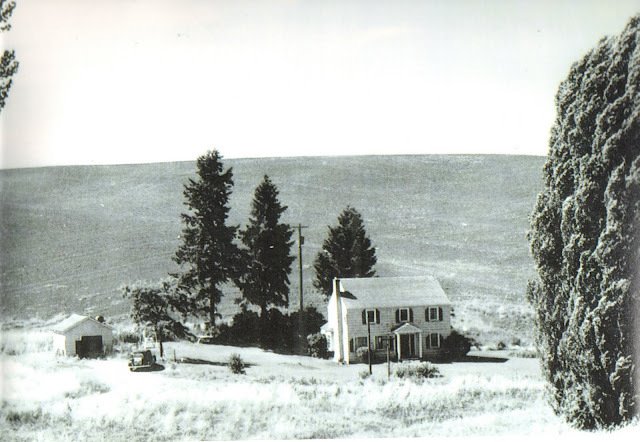 The house pictured here is a Sears Kit House that was shipped by rail to Diamond and from there the pieces where transported by the farm trucks through the hills to the home site in the late 1930s. This home still stands today, although it's been remodeled and looks much different. My Great Grandma (the same one that colorized the combine photo) is living in the house today.